Research Associates, part of International Research Ltd, is a professional national and international private investigations company. The two principle partners, Paul Hawkes and Martin Young have over 45 years experience within the field of professional investigation. This allows us to provide a highly comprehensive service within Great Britain and Worldwide. Based in Central London and West London, England, we have offered a full investigation and security service to commerce and members of the public since being established in 1977. Originally ewstablished as an agency specialising in serving the investigation industry, the company has since restructured as a ‘general service agency’, offering a responsive efficient capability to address a wide range of investigation and security tasks. All cases are discussed in full, and budgets set, before instructions are accepted. 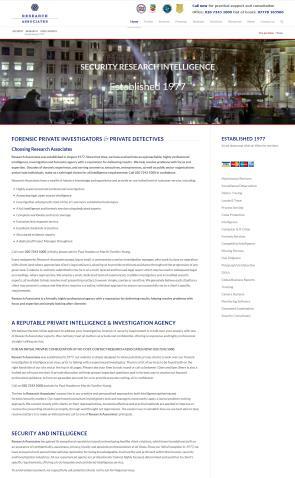 Business services: Background & general investigations, Surveillance, Litigation support, Computer/IT, Employee screening, Fraud investigation, Locate people / debtors, De-bugging. Public services: Matrimonial & personal matters, Surveillance, Information gathering, Locating missing persons, Electronic surveillance, Background & general investigation. Our established reputation is for being efficient, discreet and reliable professionals. We aim to offer our services in a thoughtful and sensitive environment. We offer a very well rounded investigation service. We are members of the Association of British Investigators (ABI). Paul Hawkes sits on the ABI Board of Examiners for new members. He is also a member of the World Association of Detectives (WAD), a member of the Institute of Professional Investigators (IPI), and the World Association of Professional Investigators (WAPI). Business and public services are available throughout the UK and internationally.